Beyond Puerperium: now with more pep! 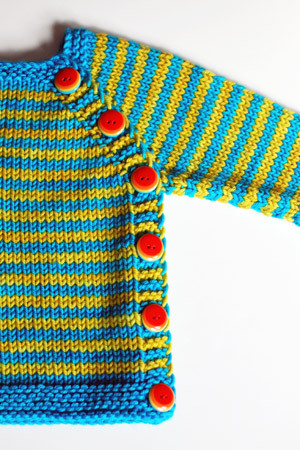 I found a way to liven up that muddy and dull Beyond Puerperium sweater – buttons! 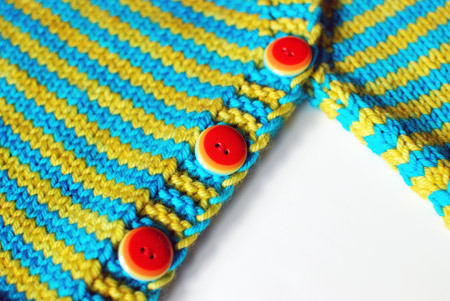 I originally thought that this sweater would look nice with bright yellow buttons, but when I actually went to the button shop (Windsor Button, FTW! ), these mainly red buttons looked really great against the fabric, and were just the right size. 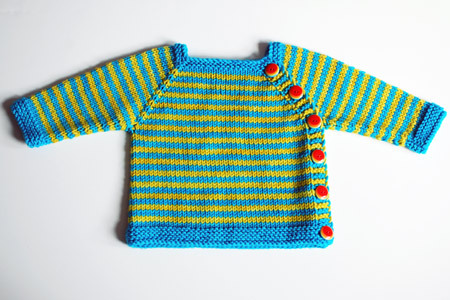 Pattern: Beyond Puerperium by Kelly Brooker, light worsted weight version, size 3-6 months, with the “long tapered” sleeves option. I didn’t make any significant changes, other than to knit the sleeves flat and then seam, in order to avoid the color jog (same as in Budgie). Yarn: Madelinetosh Tosh Vintage in oceana and chamomile, less than 1 skein of each. I’m still upset about how much the yarn bled. Gauge and finished dimensions: gauge is about 4.5 stitches and 7 rows per inch in stockinette. Sweater is about 19″ across the chest, 10″ shoulder to bottom hem, and 5″ from armpit to sleeve cuff. Overall, this is a great little sweater, despite the yarn foible. Now to wrap it up, and give it away! P.S. A recent picture of my sweet boy, for the Gregory fans among my readers :). What a great solution to your “problem.” Those buttons add “pop” to the sweater (as the makeover folks would say). OMG your son just keeps getting cuter! Ack! He’s turning into a Smurf!! But an adorable one nonetheless. Those buttons are the saving grace – good call. The sweater is a knockout! and hat last photo made me smile~ he’s a knockout too! those buttons were a very good choice. well done. Awww! Thanks for the Gregory picture. My word, it’s like an entirely different sweater! and yes, thanks for sharing a great Gregory picture, he’s certainly growing up, and so very cute! it’s probably a good thing i don’t live near that button store – i would want ALL OF THE BUTTONS! those buttons totally rock that sweater. very cute! Yes, Gregory, the blue crayons ARE the tastiest! Bon appetit! So. darn. cute. More boy than baby. Savor him! You don’t have any readers that *aren’t* Gregory fans, do you? He’s just about the cutest boy EVER!! I really like that pattern and am about to start another one. For your little guy, maybe you’ll like her other pattern, TAMA. my little boy recently had hot pink bits in his poop… expect some blue in Gregory’s! Those buttons are perfect! They really make the colors pop. Your little boy is the cutest! Gregory is sooo cute! I am always so excited when I see a post come in from you, I always read it first. You are awesome! Those crayons do look yummy! Way too cute! Love the red buttons too. Oh man, that is such a sweet little sweater (and kid!). The buttons really work wonders, looks great! And your boy is awfully cute, of course. Thanks for the Gregory pic! It is hard to believe how he has grown. I bet he is smart too! And funny? The perfect buttons; they almost look like little smiley faces. I had forgotten that crayons could be so delicious. Magic markers are even more so! The buttons do make the top look a lot less muddy. I think the yellow buttons would emphasize how much less yellow the stripes happened to be. Oh, those buttons are PERFECT! I love how they make all of the colors just pop. My goodness, your kiddo is just the cutest. Mmmm, crayons. Cute! Both Gregory and the sweater! That’s a lovely sweater. I’m sure it’ll make a great gift. Gregory is adorable. Love the red buttons and the blue mouth.